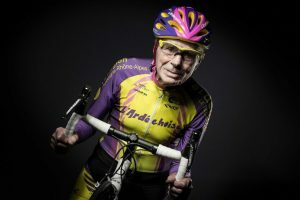 A friend of mine (thanks Jackie) sent me a link to a great article about 105 year old Frenchman named Robert Marchand which shows a clear connection with anti-ageing and cycling. It’s worth a read. But in short, Monsieur Marchand has confounded researchers by making improvements in his cycling ability even at the age of 105! I find the subject of anti-ageing quite fascinating. The older I get, the more mortal I feel, and like most of us, I want to live for as long as possible, but with a good quality of life. So I decided to do some digging and found some interesting research that was published a couple of years ago, that backs up the anti-ageing properties of cycling. Researchers from King’s College London and the University of Birmingham found that a group of cyclists over the age of 55 had levels of physiological function that would place them at a much younger age compared to the general population. The study, published in 2015 in The Journal of Physiology, recruited 84 male and 41 female cycling enthusiasts aged 55 to 79 to explore how the ageing process affects the human body, and whether specific physiological markers can be used to determine your age. The volunteers had to be able to cycle 100 km in six and half hours for men and 60km in less than 5.5 hours for women. Smokers, heavy drinkers and those with high blood pressure and other health conditions were automatically excluded. The super-fit group of elder cyclists were monitored in a laboratory for two days with a battery of tests to measure their cardiovascular, respiratory, neuromuscular, metabolic, endocrine and cognitive functions – in addition to bone strength and general health and well-being. The result was that the cyclists as a group showed few of the typical signs of ageing and that it was not possible to made generalisations about the aging process, according to Steve Harridge of King’s College London, the senior author of the study. “In general, we didn’t find the ageing we would expect to see in this age profile. We found some factors were correlated with ageing, but not strongly correlated, and some that were not correlated at all,” Dr Harridge said. “We had assumed that there is a linear straight line decline in physiology with ageing but that is very unlikely to be the case. We’re not saying we’re reversing ageing but that cycling seems to optimise the ageing process,” he said. “Because most of the population is largely sedentary, the tendency is to assume that inactivity is the inevitable condition for humans. However, given that our genetic inheritance stems from a period when high levels of physical activity were the likely norm, being physically active should be considered to play an essential role in maintaining health and well-being throughout life,” he added. The scientists chose extremely active and fit elder cyclists because of concerns that sedentary lifestyles are masking the normal ageing process, which makes it difficult to study the physical changes resulting directly from growing old, he explained. Participants were asked to perform a basic but important test of body function. The time someone takes to stand from a chair, walk three metres, turn, walk back and sit down can show they’re at a risk of falling if they take more than 15 seconds. But even the oldest riders in the study had times within the norm for healthy young adults. The study concluded that people age at individual rates, and that more research is needed that follows the same healthy and exercising individuals over time to better understand the effects of ageing the body. What’s your experience with anti-ageing and cycling? Share your thoughts via comments or the Women Who Cycle facebook page. I’m 61 years old and would like to think that maybe my cycling is slowing the aging process for me. Would like to see more research on this topic.